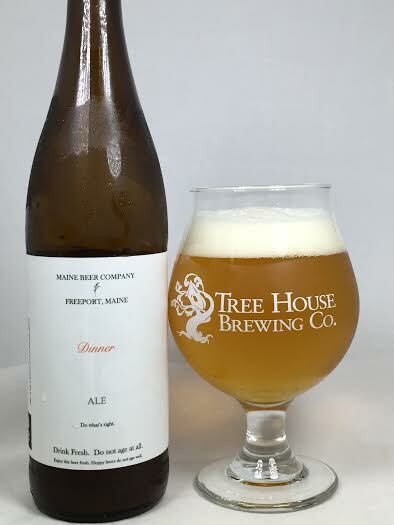 Dinner is Maine Beer Co.'s first Double IPA and it has quickly gained notoriety amongst the craft beer community. Beer release days are known to attract hundreds of people willing to line up overnight just to grab a few bottles. So what is it? Well, it's an Imperial IPA brewed with Citra, Mosaic, Falconer's Flight, and Simcoe hops and it is dry-hopped twice with over six pounds of hops per barrel. Pours on the lighter side of orange, pretty hazy with two fingers of white head. It smells like a glass or orange juice. God bless you, Citra! Some light grassy notes and melon are there as well. Huge Citra on the nose is right here on the taste. Orange juice with pulp is what comes to mind first. Then on a dime it transitions to grassy hops that are pretty dank and bitter and have a touch of garlic/onion that I associate more with West Coast IPA's. There's a bigger malt presence than I had anticipated as some breadiness isn't shy about making itself known. The finish goes right back to tropical fruits to give a juicy conclusion to the taste. Motuhfeel is almost pillowy as it is incredibly soft with perfect carbonation. The malt presence is making this dryer than your average Double IPA, but it's not a desert in your mouth. No alcohol detected anywhere and this is perfectly medium-bodied for 8.20%. It's not chewy or syrupy at all considering it's an Imperial IPA and it finishes pretty clean, but I won't go as far as to call it refreshing. Dinner has earned its title as one of New England's best Double IPA's. Considering the sheer amount of stellar offerings being churned out by the Northeast, that is a real compliment. While slightly dryer than I had wanted, Dinner delivers with huge citrus juice, bitterness, and earthy/grassy notes and makes the most out of the Citra, Mosaic, and Simcoe. hops. Winner, winner, Maine Beer Dinner!